We tend to over complicate food because it keeps people like me employed. Farmstead Aged Cheddar Crostini with Roasted Heirloom Tomato Puree sounds nice, but lets be honest, grandma would’ve called it Grilled Cheese and Tomato Soup. I fear all of this pomp and circumstance comes at cost – through the process of making food interesting, we’ve also made it inaccessible. But the truth is simple food has been feeding the masses for centuries. It doesn’t have to be gourmet to be good, especially at this time of year when we have reached the intersection of summer and fall. Warm weather foods like cucumbers and tomatoes are still available, but are making way for cool weather crops like kale, broccoli and winter squash. It’s blazing hot outside one day, and the next we unearth our jeans and favorite sweaters from the back of the closet. 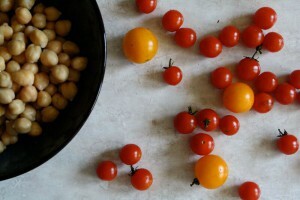 September is when life gets exponentially busier: we still have lawns to mow, gardens to tend, and houses to clean, but now we are also packing lunches, checking Friday folders, and studying spelling lists with our children all before running them to one extra curricular activity or another. Simple is best at this time of year. 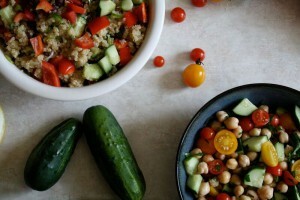 These two end of summer salads will keep for up to four days in the fridge, can be eaten as a light lunch at home, packed and taken to school or served as a simple side to dinner. 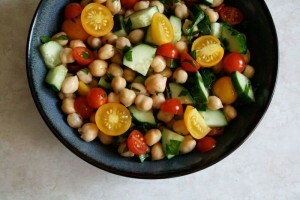 Combine chic peas, tomatoes, cucumber and parsley in a serving bowl. In a small bowl whisk together olive oil, salt, and pepper. Pour over vegetable and chic pea mixture. Toss. Add additional salt and pepper to taste. Serve cold or at room temperature. Note: If you have an ear of corn, slice it raw off the cob and toss it in the salad with the other vegetables. To make it more of a meal, add a can of tuna. Put quinoa in a fine mesh strainer and rinse under running water for about a minute. Add 1 cup quinoa, 1 3/4 cups water, 1 tablespoon olive oil and a few pinches of kosher salt to saucepan and set over medium high heat. Bring to a boil then cover and reduce to a simmer until the water is absorbed and quinoa has sprouted, about 15 minutes. Add 1 tablespoon of olive oil, fluff with a fork and transfer to a serving bowl to cool completely. 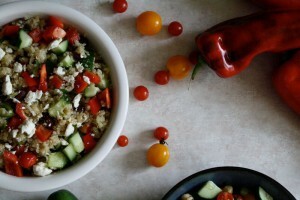 Add chopped vegetables and olives to the cooled quinoa. Stir to combine. In a small bowl whisk together 2 tablespoons olive oil, 1/4 teaspoon kosher salt, lemon juice, and lemon zest. Poor olive oil and lemon mixture over the quinoa salad. Stir to combine. Top with feta if you feel like it. Serve cold or room temperature.